This is primarily aimed at new users to Multimedia Fusion 2 and Fusion 2.5. I have seen a few people ask how to go about this in the past few days, so I figured I'd make a quick install guide. 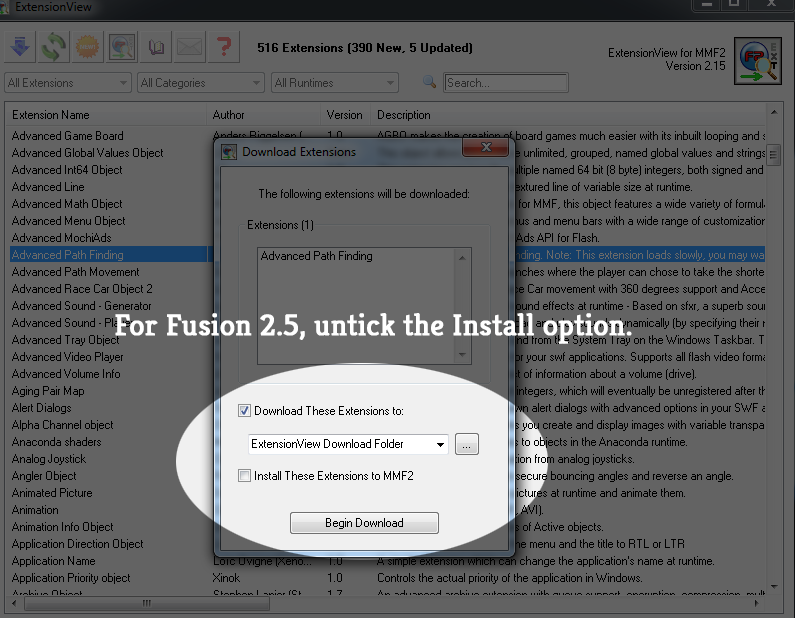 Installing Extensions (added functionality) for Multimedia Fusion 2 (MMF2) or Fusion 2.5 is simple! Both processes are relatively the same, except the first one which was introduced with Fusion 2.5. 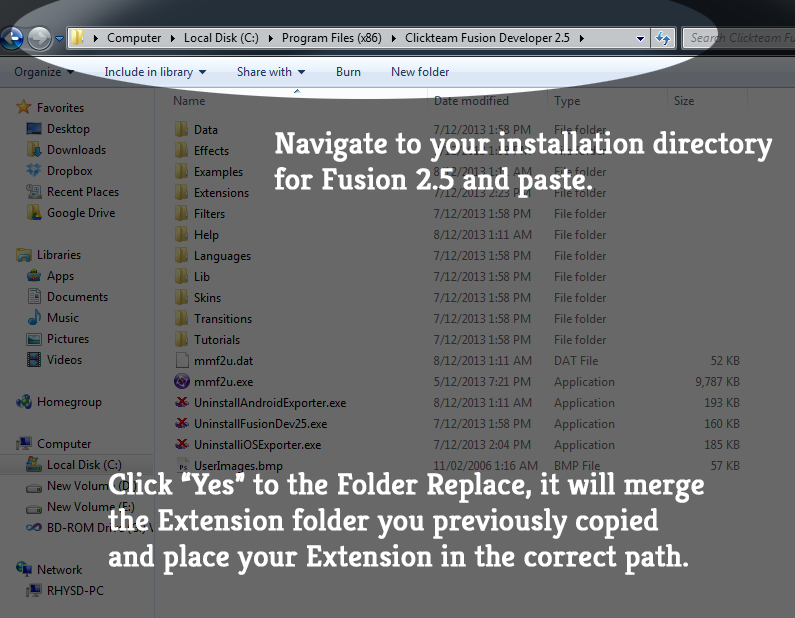 The easiest way to install Extensions in Fusion 2.5 can be seen below. To install Extensions downloaded using ExtensionView with Fusion 2.5 please follow the steps described in the images below. 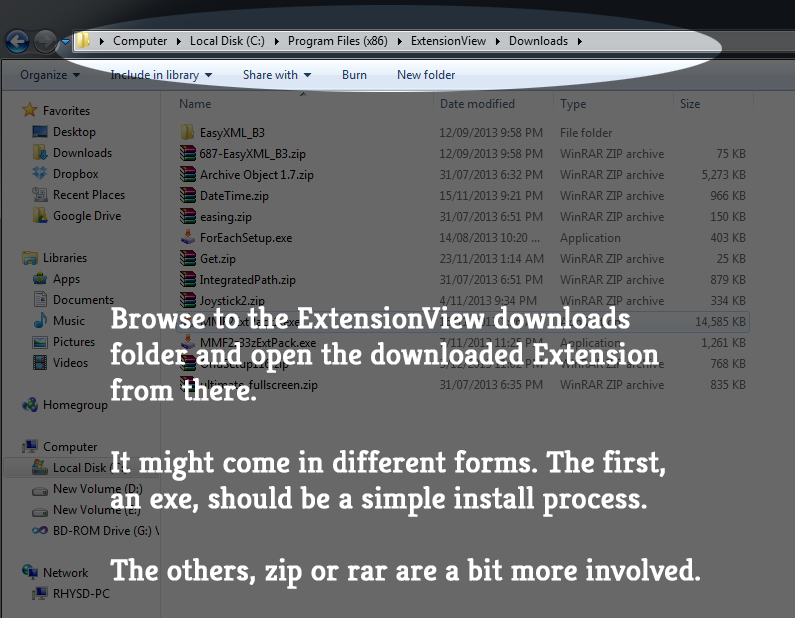 If the Extension you have downloaded is contained within a zip file, please follow these steps. Open MMF2 or Fusion 2.5 and insert a new object, you should see your newly installed Extension in the list of available objects! If it doesn't appear, try pressing the Refresh button on the right hand side. If you have any further questions, please ask away! Good stuff RhysD and thanks. Ah nice! I owe you a beverage if you ever make it to a Click Convention! So why the elaborate download manager? Wouldn't it be easier to install directly to the proper folder instead of having extensionview? Sometimes finding a link to the actual extension download is near impossible. ExtensionView lists them all in one convinient place. No I don't mean that. I mean it downloads the extension to a folder, then you have to manually go to that folder and unzip the extension and then put it in the 2.5 folder, manually. It would be easier if ExtensionView got the list from a Clickteam server and installed the extensions straight to the 2.5 directory. Less hassle. ExtensionView wasn't made by Clickteam, and the original developer seems to have vanished, so it can't be updated to get the list from an official source. The official extension list/extension manager is in Fusion 2.5, though it hasn't exactly been finished yet (the list, not the manager (the manager is finished as far as I know)). Also, ExtensionView is stubborn about not counting Fusion 2.5 as a valid copy of MMF2, meaning it can't install it in the install directory for Fusion 2.5, even though it is a valid installation. It can install them straight to the install directory for MMF2, though. Just not Fusion 2.5, since it doesn't think Fusion 2.5 is a valid version of MMF2 for whatever reason. As a result, it is only for the extensions that haven't yet been added to the official list of extensions. Also, ExtensionView doesn't always have a valid download link, either, meaning that you can't download every object out there using it (sometimes you will just have to look for it), and, since, as I have already stated, the developer of ExtensionView seems to have vanished, it probably won't get updated to get the valid download links.